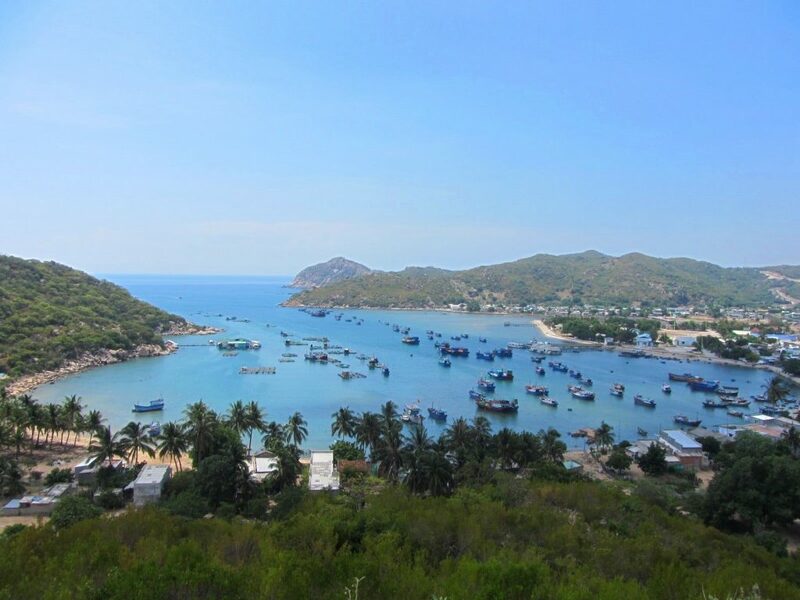 Nui Chua is a rugged peninsular jutting into the East Sea, between Phan Rang City and Cam Ranh Bay, on Vietnam’s south-central coast. The entire promontory is part of Nui Chua National Park, which protects the considerable flora and fauna in this area, including the Black Asian Bear. Because it’s so mountainous, Nui Chua Peninsular has remained relatively untouched. But a new coastal road, completed a few years ago, has revealed the considerable natural beauty of this area. The road, which winds all the way around the promontory, has opened access to spectacular beaches, forests, and mountain springs, as well as pretty little fishing harbours. 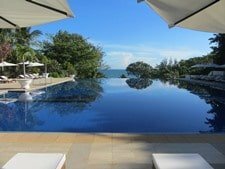 It’s a fabulous and easily manageable little road trip, perfect for those seeking to leave the well-trodden beaches of Nha Trang and Mui Ne behind. Below is my guide to motorbiking the Nui Chua Coast Road. As this is a short route, I’ve written this guide in one single section, including information about places to stay, eat, and see along the way, as well as my map and a short video. 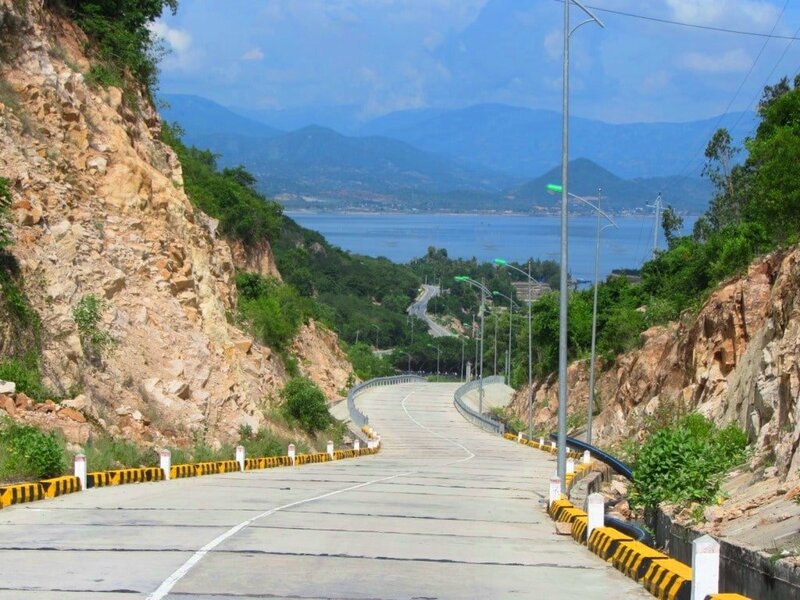 The Nui Chua Coast Road is only 55km long: starting at the northern tip of Ninh Chu Bay (near Phan Rang City) and ending at the southern point of Cam Ranh Bay (65km south of Nha Trang). 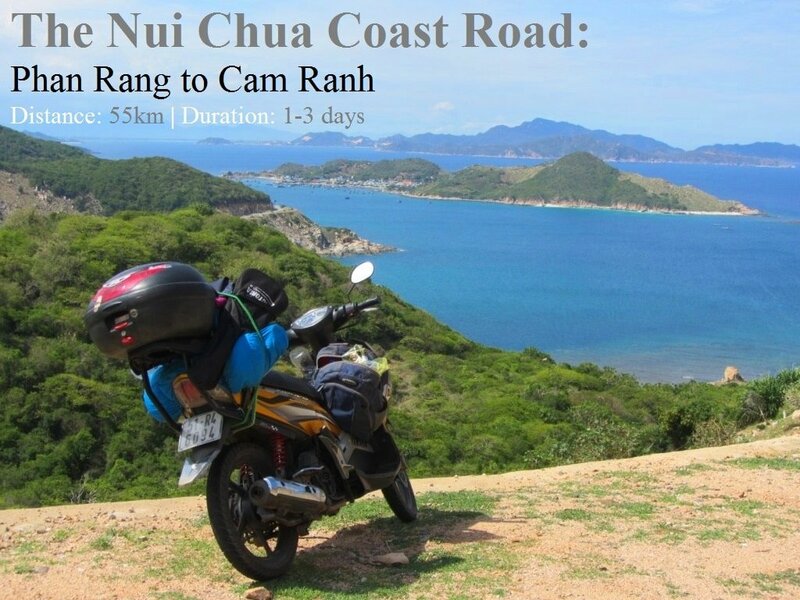 It’s easy to ride the Nui Chua Coast Road in one day, starting and ending in either Phan Rang, Cam Ranh, or Nha Trang. But, because the scenery along this road is so mesmerizing, you may find you want to spend a few days soaking it all up. Weekends and public holidays see a rise in domestic visitors, but during the week there are still very few travellers in this area. The Nui Chua Peninsular feels like a world in itself. Although in the middle of Vietnam’s hottest and driest province (Ninh Thuan), the peninsular appears to have its own micro-climate: giant clouds often bubble up over its jungled peaks, while the rest of the province bakes under the relentless sun. Weather conditions are pretty good year-round, although rainfall is more common during the late summer and autumn months. 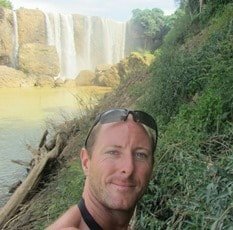 I’ve written the following guide from south to north, starting in Phan Rang and ending near Cam Ranh, but you can easily extend this road trip north to Nha Trang or south to Ca Na and Mui Ne (see Related Posts). 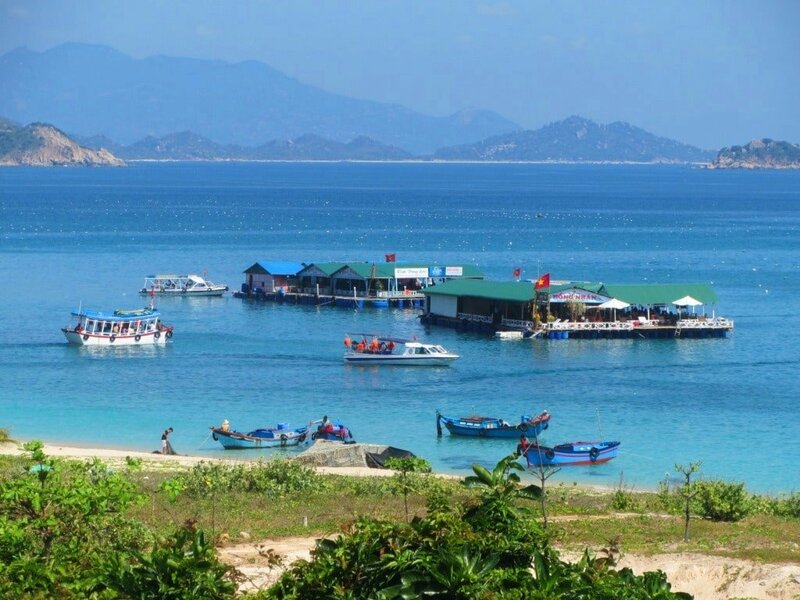 Start your road trip from Ninh Chu Bay, which is effectively Phan Rang City’s beach. 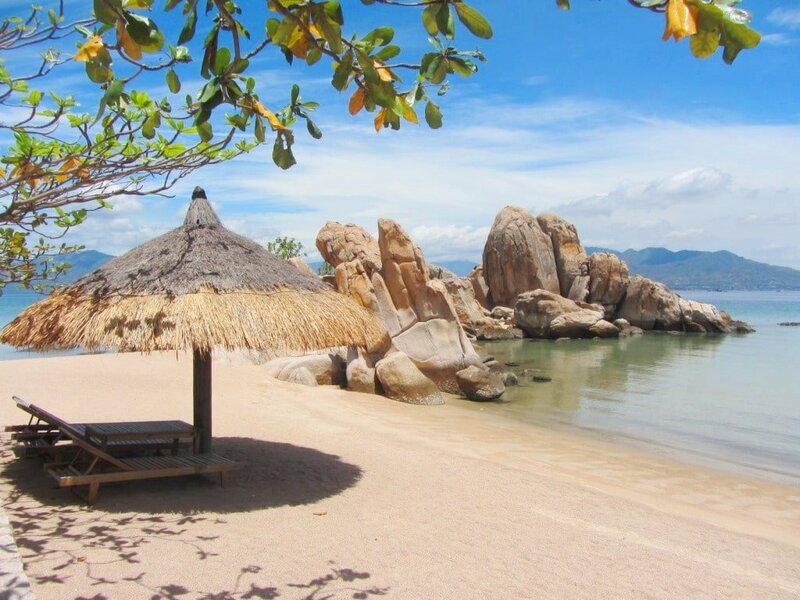 Phan Rang is an underrated beach town that’s very nice for a night or two by the sea. For good mid-range accommodation in beachfront brick bungalows head to TTC Resort (formerly Bau Truc Resort); or try the clean and spacious rooms at Hong Duc Hotel which are excellent value for flashpackers; budget travellers can camp on the beach at Ninh Chu Bay Beach Club & Bar, where you can also learn a lot about the area from the switched-on owners, Mark and Thao, and enjoy their extensive food and drinks menu. It’s also worth dropping in at the cavernous, beachside King Beer Club, which has lots of drinks available and occasionally hosts DJs and bands. At the northern end of Ninh Chu Bay turn right off Yen Ninh Road and cross a new bridge over the entrance to a pretty lagoon sheltering hundreds of fishing boats. Turn right (due east) after crossing the bridge: this is the beginning of the Nui Chua Coast Road (marked as Road DT702). The road follows the coastline for 10km, with lovely views back across Ninh Chu Bay and the rocky escarpments of Mui Dinh Promontory to the south. To the north, vast salt fields bake under the hot sun with arid, rocky mountains rising behind. As the road bears left (due north) there are a couple of small fishing communities accessed by narrow, paved lanes. With the sandy, salty wind blowing between the concrete and corrugated iron dwellings – all shuttered up in the middle of the day – they feel far removed from the relative bustle of Phan Rang City. In front of these rather rough-looking settlements the sea is the colour of aftershave, and empty wicker coracles float in the surf – a taste of what lies ahead on this road. The air is heavy with the smell of fish sauce, which is produced in several factories here. Over the next 20km to Vinh Hy Bay things gradually become lusher: rice fields replace salt fields, jungle covers the previously arid mountainsides, and settlements become fewer and smaller. While on this stretch of road you can feel the exquisite beaches that lie just out of sight – over the sand dunes, beyond the rocks, or through the trees – to the east of the road. Look out for small concrete or dirt paths, many of which eventually lead to just such a beach. Some of the beaches in this area are important nesting grounds for sea turtles and are protected by the national park – hopefully this means that big resort development will be kept at a minimum or, at the very least, be low-impact. The road is in fabulous condition as it skirts swathes of deserted coastline and plunges into rich forest. The land immediately to the side of the road belongs to small household farms. Depending on the season, you’ll see dozens of red chilli bushes, herbs, cashew trees, vegetable gardens, and lots of grape vines. The climate in this area (and the province in general) is favourable to vines, and this is where most of the grapes used to make Dalat wine come from. 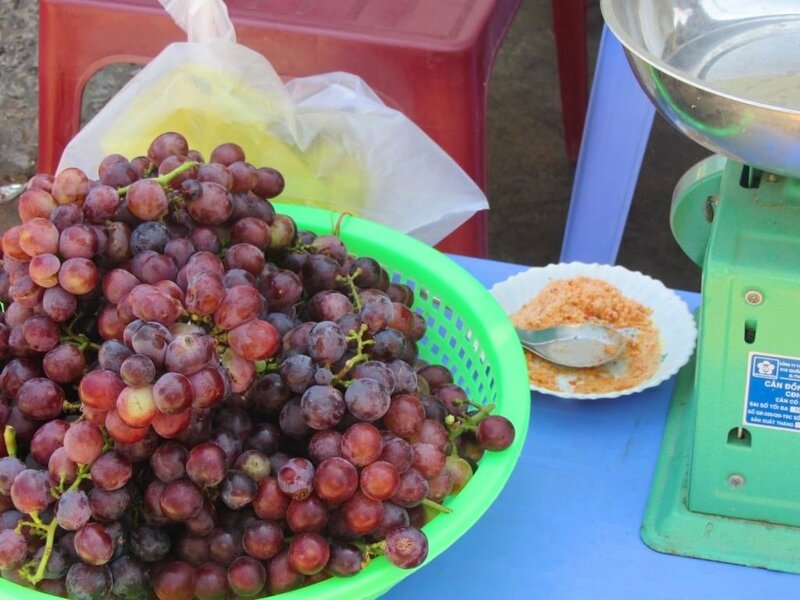 Look for signs by the roadside saying bán nho tươi, rượu nho, mật nho – fresh grapes, grape liquor, and grape honey for sale. But be aware that the rươu nho grape liquor is very sour and more reminiscent of vinegar than wine. After climbing up through impressive jungle-covered mountains on the edge of Nui Chua National Park, the road drops into Vinh Hy Bay. An absurdly scenic inlet of water between two mountainous headlands, a small fishing village lies at the centre of this bay. There are a few shops and local places to eat on the harbourfront, where wooden fishing boats anchor in the calm bay. It’s a peaceful, beautiful place that’s a natural stop for lunch as it’s located halfway along the Nui Chua Coast Road. Glass bottom boats take you to nearby coral reefs and other beaches hidden in coves along the coast. There’s a ticket kiosk for boats near the waterfront after crossing the narrow bridge into town. (Note: this bridge is currently undergoing renovations so access to the harbourfront is from behind the town, after crossing another bridge.) Behind Vinh Hy Bay, a small, steep lane winds up the hillside to a couple of interesting minority hamlets and mountain streams. Vinh Hy is definitely a place to linger, so consider staying the night here, if you have time. 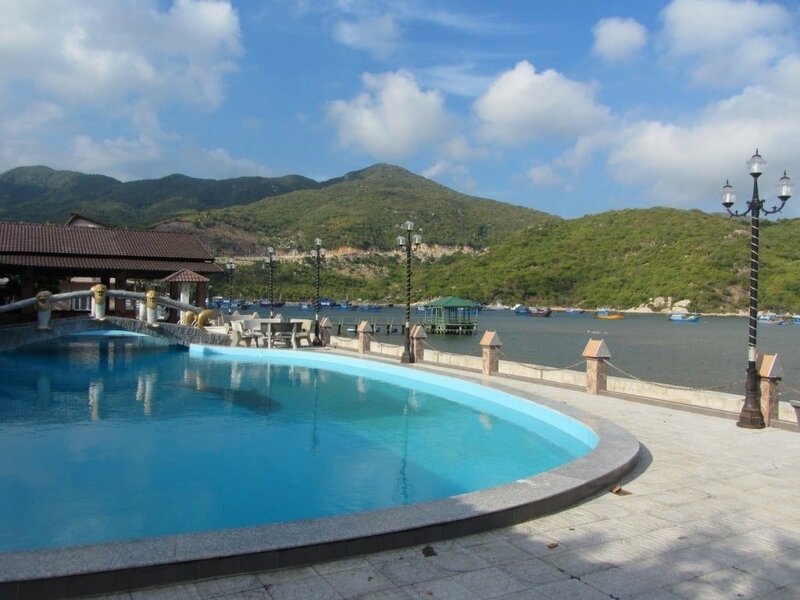 There are a couple of nhà nghỉ (local guesthouses) in the narrow backstreets (look for the signs), but the best value accommodation is Vinh Hy Bay Resort, which has a fabulous position on the waterfront. There’s also a new, ultra-luxurious resort perched on the cliffs above the bay, called Amanoi (www.amanresorts.com/amanoi). Inspired by traditional Vietnamese architecture, it’s a bit like entering an ancient imperial palace complete with modern conveniences. It’s tasteful and luxurious indeed (and it should be for upwards of $1,000 a night). This resort has put Vinh Hy Bay on the luxury tourist map, and there are other high-end resorts planned for the beaches along the Nui Chua Coast Road: now is the time to visit if you want to experience this coastline before developers move-in and claim all the good beaches. The menu at Vinh Hy Bay Resort is good and they can also arrange a trip to the floating fish farms in the bay, where you can pick your live seafood and take it back to the resort for them to cook. 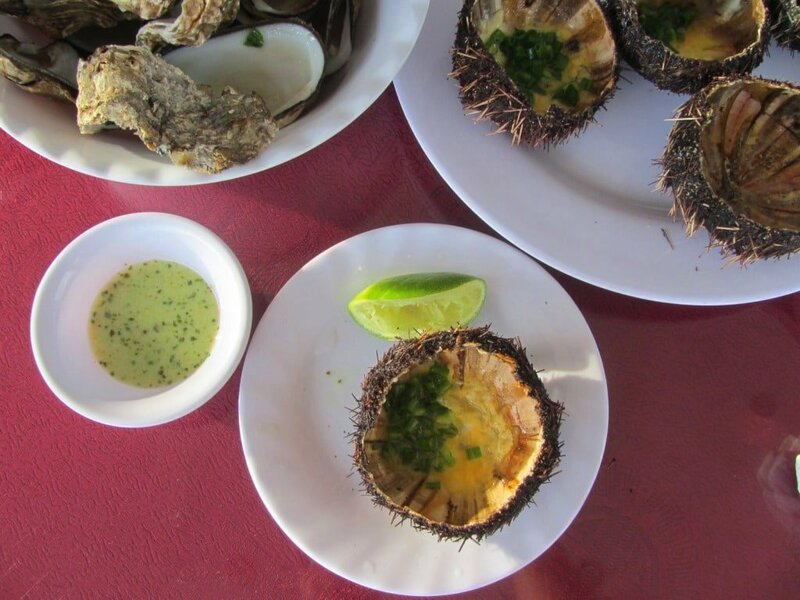 Choose from oysters, urchins, grouper, and many other varieties of seafood. In the evenings, several street food vendors, mostly specializing in bánh xèo (savoury Vietnamese pancakes), set up on the sidewalk on the south side of the village bridge. Strolling the seafront promenade at dawn and dusk is marvellous. From Vinh Hy Bay the road winds all the way up a mountain and down the other side to Cam Ranh Bay. 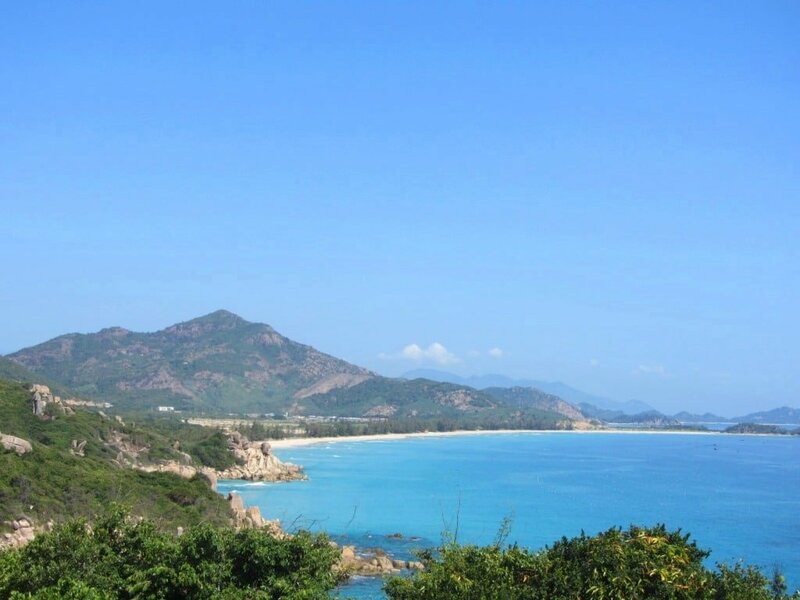 This section of road boasts some of the best coastal vistas in Vietnam. First, the road climbs up a forested and rocky mountainside: the views back down over Vinh Hy Bay getting better with each hairpin bend. Once Vinh Hy is out of sight, the tarmac ploughs through dense forest, high above the ocean. This is when Nui Chua’s micro-climate becomes apparent: it feels more like the Central Highlands than the driest province in Vietnam. There’s a bit of a chill in the air thanks to the foliage, wind, and altitude (Nui Chua reaches a height of over 3,000 feet). Somewhere in these forests are exotic animals, such as the Black Asian Bear (which can be gigantic), the Sun Bear, and a healthy population of Black-shanked Douc (a type of primate that looks like a character from Japanese anime movie, Spirited Away). 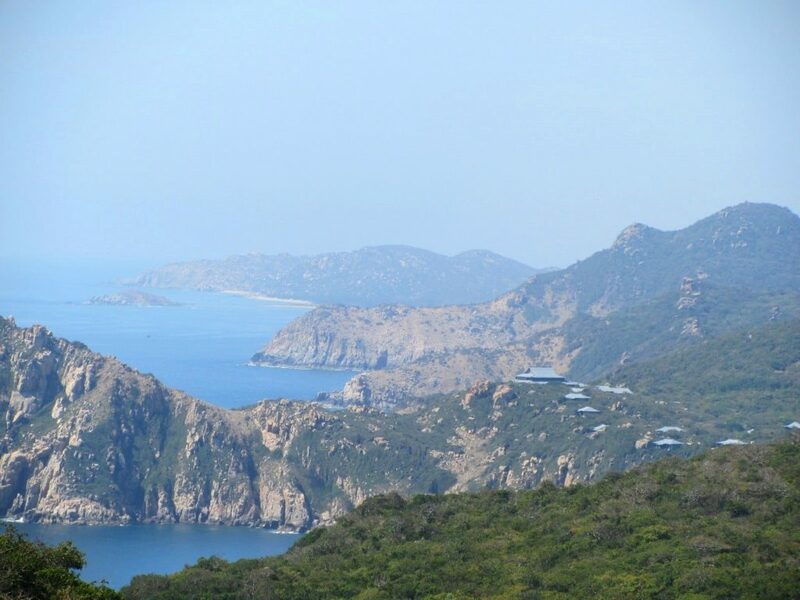 Once at the top of the pass, there are immense views down over Cam Ranh Bay, with beaches nestled under cliffs in the foreground, and the purple-tinted Annamite Mountains rising in the distance. Several viewing platforms make good photo or picnic stops. Turn off your engine and quietly glide down this amazing road, each meandering bend opening up another panoramic view across the East Sea. The only things obstructing the views are the enormous concrete electricity pylons that line the road. As the road reaches sea-level again, there are small pathways leading to some of the beaches that you glimpsed from atop the mountain pass: make sure you leave some time for exploring these. There are at least half a dozen glorious beaches along the next 10km of coast road, none of which have really been developed yet, and all of which are fantastic for swimming. As the road leads along the coastline, you’ll notice that one of the beaches has a lot of activity around it. This is where tourist boats come and go, ferrying passengers to and from the floating seafood restaurants on the turquoise water and the nearby island of Binh Hung. 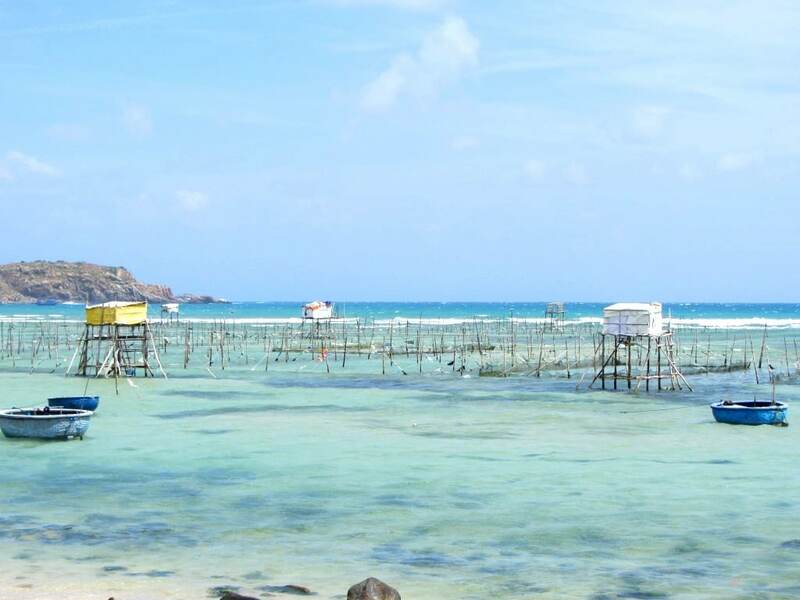 Although this is a great little trip (especially for some terrific seafood), this area is considered militarily sensitive and you may find officials refuse to allow foreign visitors to the island. 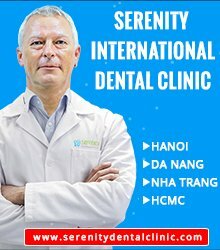 But it’s still worth a try as these kind of restrictions are rapidly being relaxed all over Vietnam. The other problem is that this is a very popular trip for domestic tourists, which means it can get crowded on weekends and there’s a fair amount of hassle from hawkers. On the left-hand side, a few kilometres after descending the mountain pass, is an inviting fresh-water spring, gushing off the mountainside and forming a couple of nice pools for swimming. This is a great spot. However, although the spring will probably be deserted if you stop by on a weekday, the amount of litter jammed between boulders in the stream suggests that this is a popular weekend and holiday spot for domestic tourists. 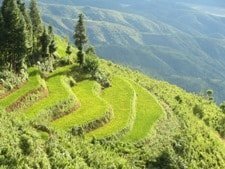 Sadly, this is something you encounter over and again in Vietnam: the Vietnamese love to picnic in beautiful natural surrounds – which is an admirable and endearing cultural trait – but few people bother to take their litter away with them. (Read more about the problem of trash in the Vietnamese countryside HERE). If the litter puts you off bathing in this spring, there’s another good river a few kilometres further along the coast road, just after the road descends steeply and turns to concrete slabs rather than asphalt. The water here comes straight off the mountains in Nui Chua National Park, so it’s cool, clean and refreshing. 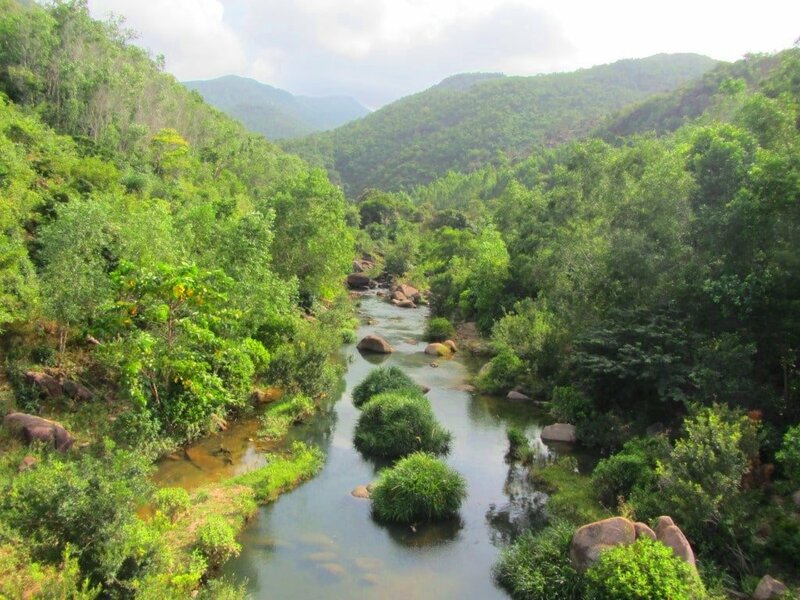 It’s a real treat to find clean, fresh-water swimming in this part of Vietnam – usually you have to go high into the mountains to find rivers that aren’t polluted. Just a couple hundred metres after the river, there’s a right turn (due north) planted with a cluster of signposts. Turn here for Cam Lap Promontory, one of the loveliest corners of coastal Vietnam. Only take this road if you like empty, white-sand beaches and turquoise seas surrounded by fruit plantations, and little concrete lanes that end in isolated fishing hamlets with friendly local people, and wooden boats bobbing in sheltered rocky coves, and small, informal eateries with great seafood right on the beach, and sunsets over one of the world’s biggest natural harbours with mountains looming up behind it. You can camp on the beach here, stay in good dorm rooms, or splash out on a room on stilts over the sea. Find all the information you need in my full guide to Cam Lap Promontory HERE. 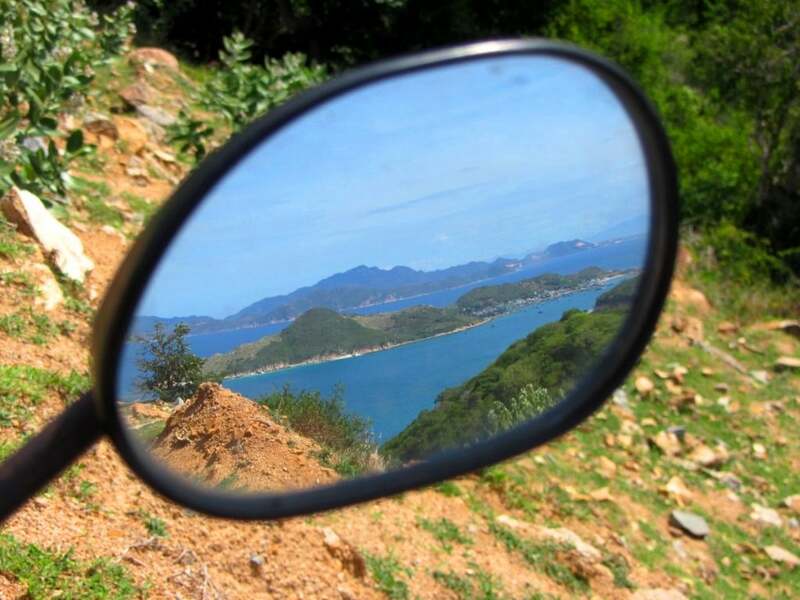 After passing the turn for Cam Lap Promontory, the Nui Chua Coast Road heads west, out of the national park and along the southern shore of Cam Ranh Bay, passing picturesque rice fields before ending at Highway QL1A. Turn right (due north) onto the highway for Nha Trang (65km), or turn left (due south) to take the highway back to Phan Rang City (35km). 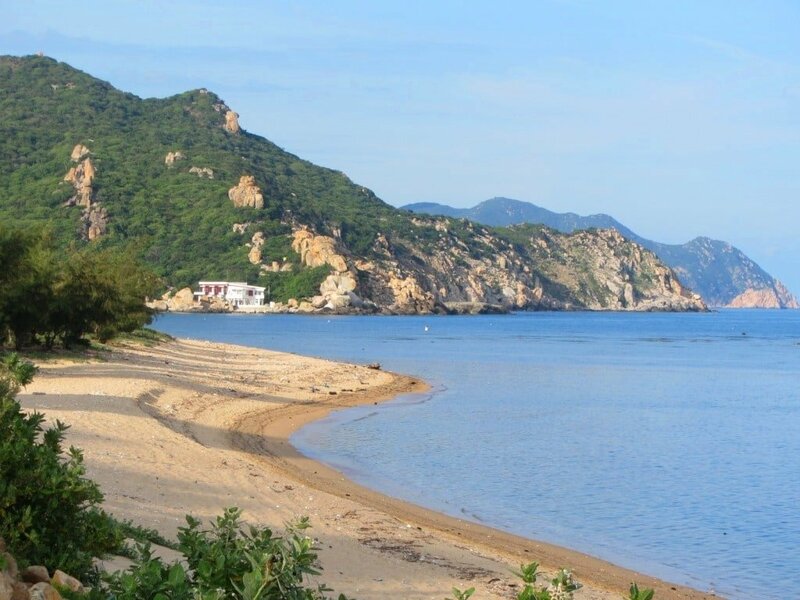 A nice extension to the Nui Chua Coast Road is to head inland (due west) on either the Cai River Road or the Burnt Road, both of which will take you back (on a circuitous but scenic route via Cam Ranh and the mountains) to Phan Rang. For more links to my guides along this stretch of coast, take a look at the Related Posts below. 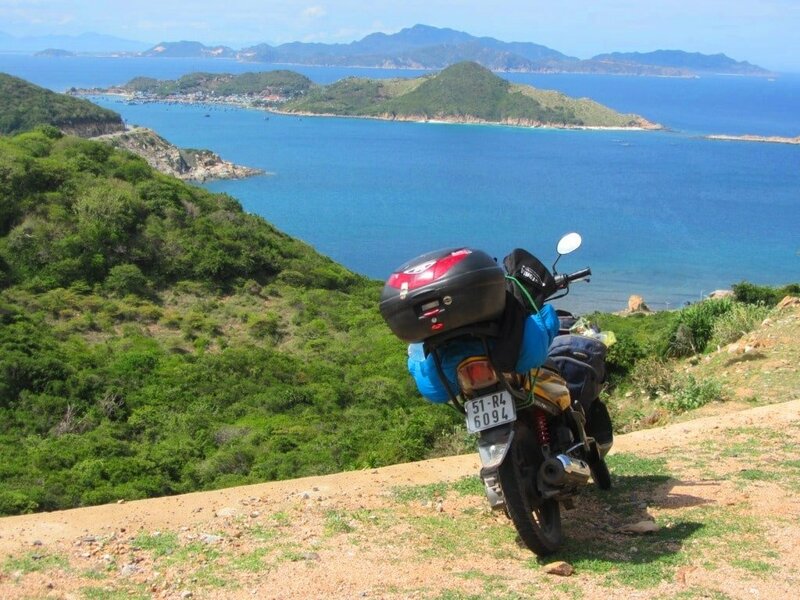 This entry was posted in ALL, Coastal, MOTORBIKE GUIDES, The South and tagged beaches, Cam Ranh, guide, motorbike, Nha Trang, Nui Chua, Phan Rang, travel, Vietnam, Vinh Hy. Bookmark the permalink. I am following the classic route but it seems like this place is worth a visit. 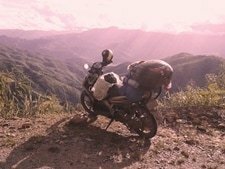 Would you recommend to go from Nha Trang to Dalat first and then take the QL27 or QL27B back down to the Nui Chua Coastal Road. Or should I go from Nha Trang to the Nui Chua Coastal Road and then up to Dalat via the QL27 or QL27B? Guess it comes down to which road is more scenic, Nha Trang to Dalat or Dalat to Mui Ne? If you have time to go up to Dalat from Nha Trang on QL27C then come back down on QL27 and 27B and then do the Nui Chua Coast road from Cam Ranh to Phan Rang then that would be ideal – because that way you don’t miss any of those scenic roads. Awesome thanks for your reply. So basically I won’t miss much if I don’t take the road from Dalat to Mui Ne? Not compared to the other roads up to Dalat from Nha Trang and Phan Rang. Here’s some feedback on this itinerary; we cycled it from North to South. Another comment mentions the beach at Binh Tien and it was indeed beautiful; while not as impressive as the beaches at Cam Lap, it was extremely clean and absolutely empty. There’s a new hotel in this small town, which may make it a nice stop for a day ! Between there and Vinh Hy, it was absolutely pure cycling pleasure. The road surface was great, it climbed gently and the scenery was extremely beautiful. We also appreciated the viewing platforms, which meant we didn’t have to stop the bikes hazardously on the side of the road. Vinh Hy’s harbor was beautiful. Apart from the ‘resort’, it was hard to find food in the evening; however, during the day, we enjoyed excellent banh can and banh xeo sold by a very smiling old lady. The remaining of the road between Vinh Hy and Phan Rang is definitively less impressive, but still pleasant. I totally agree with your opinion on Phan Rang being underrated. When we were there, the beach was clean, and we didn’t oppressed by all the concrete like in Nha Trang. It was very pleasant to order a drink in one of the nearby hotels and enjoy the view ! Speaking of hotels, Hong Duc was an excellent accommodation, well located and with friendly owners. 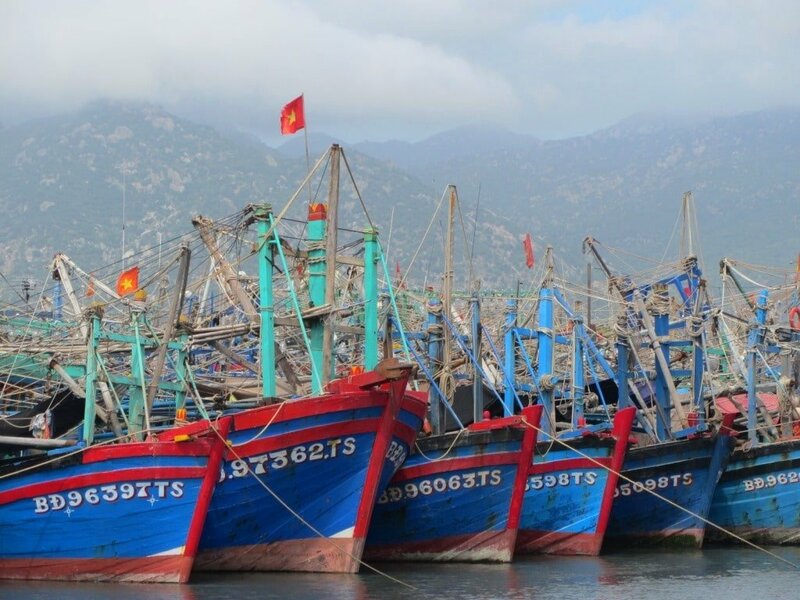 The center of Phan Rang and Thap Cham were definitively less pleasant than the beach area, so I strongly advise people to stay close to the beach ! The sand dunes a few kilometers South of Phan Rang are worth a visit; they’re rather small but look great. Thanks for your feedback. Glad you enjoyed this route. I can’t wait to get back soon – I should be heading there during the Vietnamese New Year holiday in February. I love your posts. I was thinking of making the trek up here from Ho Chi Minh. I was wondering if you know if it’s possible to camp on any of these secluded beaches? Certainly – there are plenty of great places to camp on Cam Lap Promontory, which is just off the Nui Chua Coast Road. Check out my guide here. And also my camping guide here. Thanks. It’s great to hear that you’re enjoying my posts. 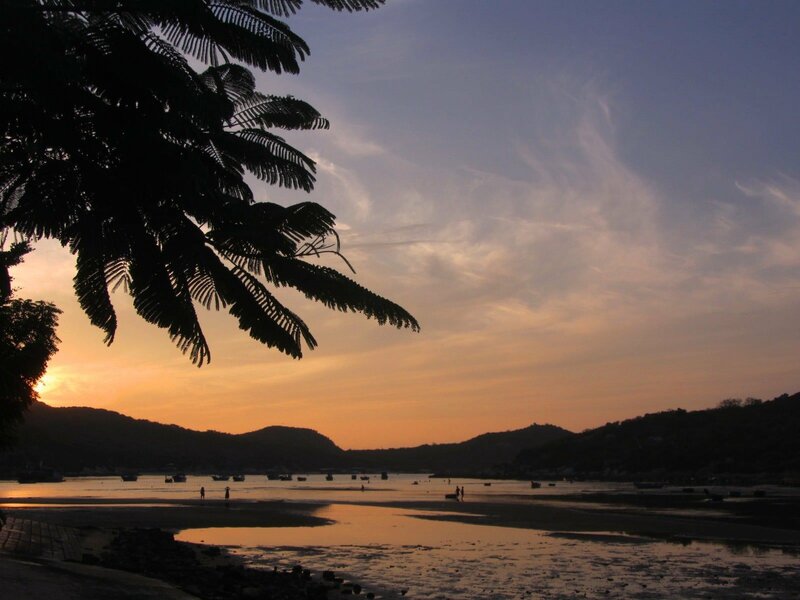 Definitely try to head south from Nha Trang to Cam Lap Promontory and the Nui Chua Coast Road – it’s great. I did this drive today…was spectacular, thanks for all the great advice! Binh Tien beach at the very end of the road shortly before the turn off for Ngoc Suong is the nicest beach Ive ever seen! Thanks again, Im following a lot of your ideas for my first full south to north trip! Glad you enjoyed it. Yes, I love the beaches around there too – and still very little development: lovely. No, I don’t think that’s possible on this particular trip. However, the Nui Chua Coast Road is a pretty short and easy road trip, so you can ride it and back in one day if you start early. It’s a beautiful trip so don’t miss it! I don’t understand your question about Phu Quoc – do you mean how to get from Phu Quoc to the Nui Chua Coast Road? I’m in vinh hy right now and the journey from Nha Trang was everything that you said. Thoroughly recommended. The journey took twice as long as anticipated because I had to keep stopping as the views are so amazing. There are now lots of well laid out stopping /view points along the way. Sounds great – I love that area. I hope you continue to enjoy your trip! I need a description of the salt flats, at Phan Rang also directions from the beach to the salt flats and from the salt flats to the air field. Follow Ninh Chu Beach (in Phan Rang) north. Then turn right (due east) on the road to Vinh Hy. The salt flats are on your left about 10 minutes after turning onto this road. Great!! 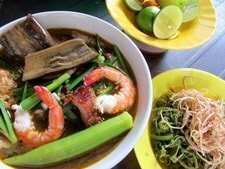 One of the best descriptions of the best place in Vietnam I’ve seen. A quick updates: The Aman Resort Vinh Hy Bay is now called Amano’i and it is indeed a true eco-resort. Villas can cost up to $9,000/night. Also, Ninh Thuan is not the hottest province in Vietnam. It definitely is the driest and has the most sunny days, but its hottest months are not nearly as hot as other provinces, even as far north as Danang. Because of the Nui Chua mountain range, the climate is the only classified “Mediterranean Climate” in East Asia. All of Vietnam’s famous grapes come from here, and they can only grow in moderate climates.